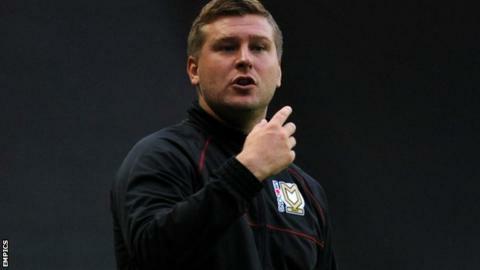 MK Dons boss Karl Robinson has vowed to continue giving the club's youngsters first-team opportunities despite opting for experience in the transfer market. Defender Mason Spence, 18, was given his debut in the midweek Johnstone's Paint Trophy defeat at Northampton. "It was a very accomplished performance, a very strong debut," Robinson told BBC Three Counties Radio. "We've not lost our core values. If the young players are good enough, they're going to be given the opportunity." After losing out in the promotion play-offs last season, Robinson bolstered his squad over the summer by bringing in Jon Otsemobor, Alan Smith, Ryan Lowe and Antony Kay - all players with years of experience. And he continued that policy last month by bringing in midfielder Jimmy Bullard, 33, on a short-term contract. Despite that, Robinson said: "There are four or five players in the Academy we've given a debut to in a very short period of time. "I find it hard to think of any other club with a better ratio of players coming through and making a difference in the first team." Spence's progress has been rewarded with a call-up to the Wales Under-19 squad for their forthcoming friendly against Germany in Kiel. Meanwhile, another Dons youngster, 20-year-old defender Tom Flanagan, has been impressing for Gillingham since being allowed to join the League Two club on loan. Robinson added: "He's gone there to play games. For the longevity of the club, we need these players to go and play football and not just be sat on the bench or wasting away in the reserves. "He wanted to go and play and make himself better for MK Dons and with that type of attitude, it was very hard to say no to him."